Do your Research: Prior to calling and contacting a mobile app development company, be sure to do your due diligence and research several companies to figure out if they can provide you with what you are looking for. It pays to spend a good amount of time researching and finding a developer that is the perfect fit. Be sure to browse through company websites and look at their portfolio to see if their work lines up with your vision. If the developer’s website does not impress you, then how likely is it that you will be impressed by the mobile app that they develop? Also, make sure to check out their FAQ page because this could probably answer most of your questions and help save you some time. Discover your ideas: Before most companies will move forward and start your project, you will have to go through a discovery or exploration session with them to see if they can complete your project. When you attend a discovery session it is important for you to be able to discuss your idea and convey exactly what you want your app to do and who your target audience will be. This is usually a face-to-face meeting and it is good to be prepared and know that most companies will charge you for this session. This will usually take a couple of hours to pull the ideas from your head and put them on paper in order to create a quality plan to complete your project. Identify the Process: When you are choosing a mobile app development company, ask them what their process is? It is important to know how you will communicate with them throughout the process and what the stages of development will be. Most mobile development projects can take months to complete, so make sure you choose a company that will keep you up-to-date on your project. Plan and Strategize: It is imperative to think past the development of your mobile app. What if you created your mobile app and no one cared? It would be a nightmare to spend thousands of dollars developing your app and setting it up on the app store when no one downloads it. Development is just one aspect of your app. The mobile app development company that you choose should be able to build a comprehensive mobile-app road map that will ultimately drive engagement and deliver results for your business. Make the Best Investment: When you are choosing a mobile app development company, it is imperative that you are not penny wise and pound-foolish. The cheapest quote may seem the most appealing, but know that you get what you pay for. Many development companies will underprice their projects to get the contract and then struggle to deliver. You should choose a mobile app development company that is experienced and reputable that can give you exactly what you are looking for. If you buy cheap, you may have to buy twice. Keep it In-House: Many mobile app development companies will sign a contract with a client and then pass the work off to a company overseas. 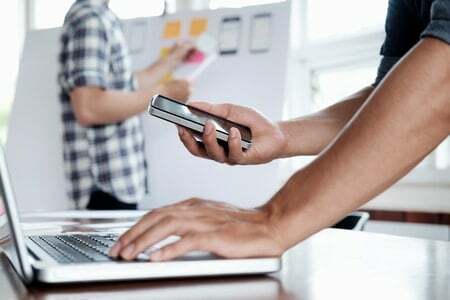 Developing a mobile app can be a colossal undertaking, but if you are hiring a development company you want to be sure that the employees in that company are doing the work. You want to know that you can communicate what you want with the developer throughout the process. Developing a successful app requires a team of mobile strategists, designers, and developers working together, which is accomplished more successfully in-house. Think of the Whole Package: Developing an app is not just about coding, it is also about creating a functional design that will ultimately create the best user experience possible. It is not advisable to choose an independent developer because a development, design, and mobile strategy team are also paramount to your success. You need the full team to perform vital functions such as design, usability, and testing for your app. Commitment to user experience: User experience encompasses much more than just good graphics; it is about giving users an emotional and gratifying response to the app created. The best mobile app development teams are comprised of designers that understand app designs geared toward natural human behavior will end up creating an impact and disrupt the current mobile app market. Up-to Date on Technology: The right mobile app development company will have a proven track record of working with the latest and greatest technologies. A few specific questions will give you a good sense of the company’s innovative abilities. Best Personality Fit: Know what sort of company that you would like to work with. Are you looking for a more formal, or more laid back company? Look for companies that mesh well with your professional style and personality. In order for the mobile app development process to go smoothly it is important to find a mobile app development company that you fit with. If you are interested in a mobile app development company then Contact Us today to learn more. SolutionBuilt designs and develops iPhone, iPad, and Android mobile apps tailored to your specific business.